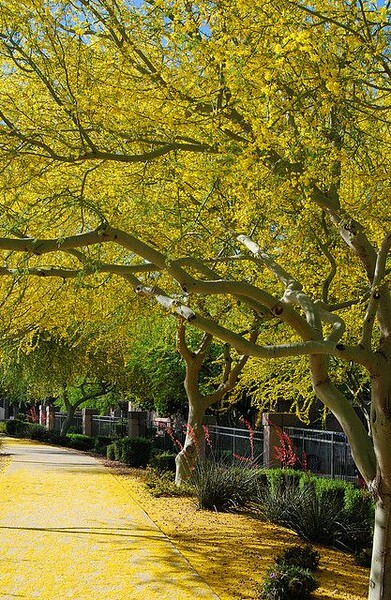 Parkinsonia aculeata 'Desert Museum' (Mexican Palo Verde) - Native to Mexico. Small picturesque round-headed tree of 15-20 feet tall with open lacy foliage that yields a pleasant dappled shade. It has a trunk and branches with yellow-green bark and within the fine-textured foliage small thorns are nestled. Showy, fragrant yellow flowers with throats having orange-reddish color spots have a peak bloom period in summer with scattered bloom year-round. After flowering a tan fruit pod forms with a papery sheath. Good for filtering sun to create light shade and very drought tolerant once established. Hardy to at least 20-25° F. Occasionally gets powdery mildew along the coast or where over-irrigated but this goes away with drier weather – the thornless and sterile hybrid that is called Parkinsonia 'Desert Museum' is a wonderful plant in inland gardens and certainly better in the low desert because it does not reseed.